KATHMANDU, Nepal -- A new earthquake killed dozens of people Tuesday and spread more fear and misery in Nepal, which is still struggling to recover from a devastating quake nearly three weeks ago that left more than 8,000 dead. A U.S. Marine Corps helicopter carrying six Marines and two Nepalese soldiers was reported missing while delivering disaster aid in northeastern Nepal, U.S. officials said, although there have been no indications the aircraft crashed. Tuesday's magnitude-7.3 quake, centered midway between Kathmandu and Mount Everest, struck hardest in the foothills of the Himalayas, triggering some landslides, but it also shook the capital badly, sending thousands of terrified people into the streets. Nepal's Parliament was in session when the quake hit, and frightened lawmakers ran for the exits as the building shook and the lights flickered out. 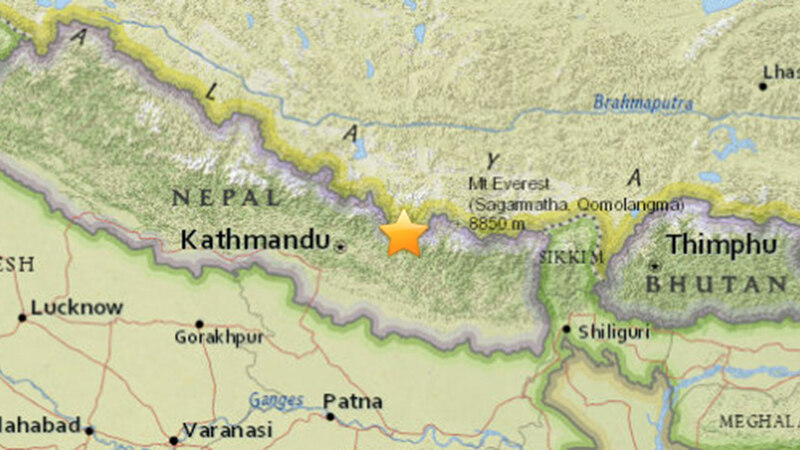 At least 37 people were killed in the quake and more than 1,100 were injured, according to the Home Ministry. But that toll was expected to rise as reports began reaching Kathmandu of people in isolated Himalayan towns and villages being buried under rubble, according to the U.N.'s Office for the Coordination of Humanitarian Affairs. Tremors radiated across parts of Asia. In neighboring India, at least 16 people were confirmed dead after rooftops or walls collapsed onto them, according to India's Home Ministry. Chinese media reported one death in Tibet. The magnitude-7.8 earthquake that hit April 25 killed more than 8,150 and flattened entire villages, leaving hundreds of thousands homeless in the country's worst-recorded quake since 1934. The U.S. Geological Survey said Tuesday's earthquake was the largest aftershock to date of that destructive quake. Tuesday's temblor was deeper, however, coming from a depth of 18.5 kilometers (11.5 miles) versus the earlier one at 15 kilometers (9.3 miles). Shallow earthquakes tend to cause more damage. Search parties fanned out to look for survivors in the wreckage of collapsed buildings in Sindhupalchowk's town of Chautara, which had become a hub for humanitarian aid after last month's quake. In Washington, Navy Capt. Chris Sims said the missing Huey helicopter was conducting disaster relief operations near Charikot, Nepal. A nearby Indian helicopter heard radio chatter about a possible fuel problem, said U.S. Army Col. Steve Warren. The Huey, carrying tarps and rice, had dropped off supplies and was headed to a second site when contact was lost, he said, adding that there has been no smoke or other signs of a crash. A Nepalese air brigade unit had seen the Huey, so Marines in V-22 Osprey aircraft searched unsuccessfully near its last known location for about 90 minutes, Warren said. Members of the Nepalese army are searching on foot because of darkness, he added. Due to the rugged terrain, the helicopter could have landed in an area where the crew was unable to get a beacon or radio signal out, Warren said. Tuesday's quake was followed closely by at least 10 strong aftershocks, according to the USGS. "Everyone was saying the earthquakes are over. ... Now I don't want to believe anyone," said 40-year-old produce vendor Ram Hari Sah as he searched for a spot to pitch the orange tarpaulin to shelter his family. "We are all scared, we are terrified. I would rather deal with mosquitoes and the rain than sleep in the house." Residents of the small town of Namche Bazaar, about 50 kilometers (35 miles) from the epicenter of Tuesday's quake and well known to high-altitude trekkers, said a couple of buildings damaged earlier had collapsed there as well. However, there were no reports of deaths or injuries. The earth also shook strongly in neighboring Tibet, unleashing a landslide that killed one person and injured three, according to China Central Television. Two houses collapsed, the state broadcaster said, quoting disaster officials of the regional Tibetan government.